We slept in after a long and stressful previous day. Sheila and Austin have an espresso maker, so we had coffee and breakfast in the apartment with Sheila. Then we got up the nerve to go out into the city on our own. We walked around near the apartment, with the skies threatening rain. 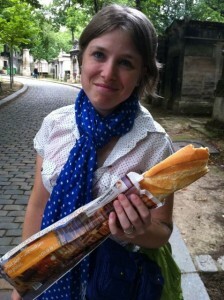 We bought our first baguette to snack on. 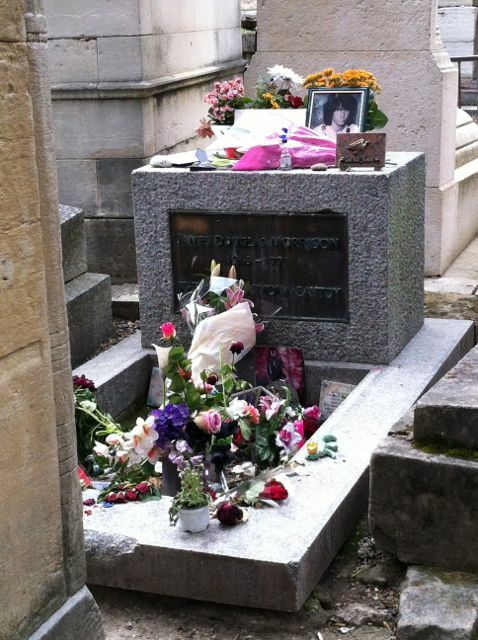 First, we went to Père Lachaise, a HUGE cemetery where we saw the tombs of Jim Morrison, Chopin, and possibly Georges Seurat. 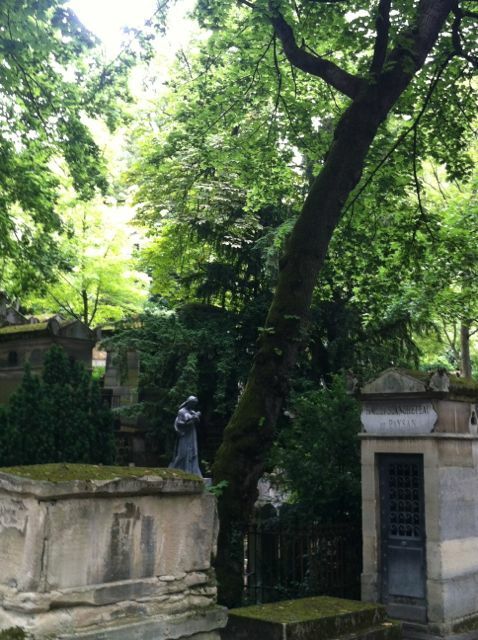 We explored less than 1/3 of the cemetery, the rest of which includes the resting places of Oscar Wilde, Gertrude Stein, and other luminaries. After the cemetery, we walked to Saint Croix church, and the rain began to fall, so we went back home. 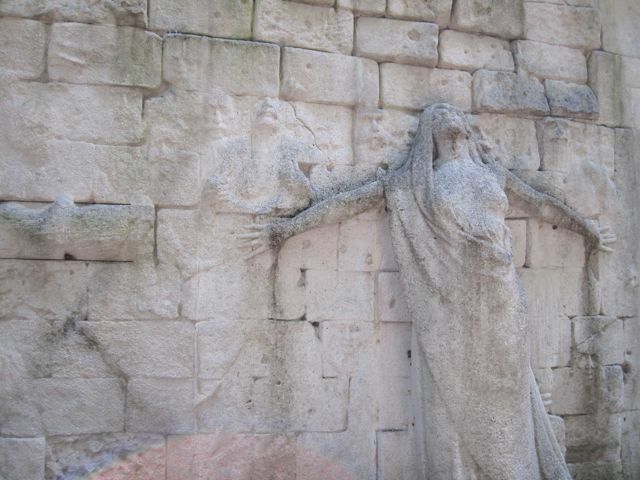 Lots of creepy things in the graveyard… this partial wall outside the graveyard seems to be depicting a woman holding back the spirits of the dead from leaving their resting place. Not long after, we went back out, to Parc de Belleville. 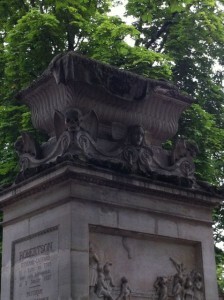 This beautiful, large public park is very close to the apartment. There is an amazing playground that looks kind of like an abstract pirate ship that has been built into the side of a fairly steep hill. This would never exist in the present United States, as it looked like an invitation to litigation. But the kids were having so much fun crawling and running in and out, up and down, and all around. The park also has beautiful rose gardens and beds of wild flowers. Kids were playing everywhere… we were definitely in the way but they didn’t seem to notice us. 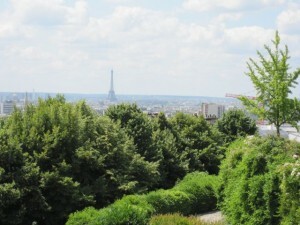 We climbed up the hill to behold an amazing view of Paris… our first real sight of the Eiffel tower. It was just magical, and surreal. We wandered back down, getting lost a little bit on the way home. We stopped by the grocery store, picked up supplies for dinner (pasta with homemade marinara sauce), plus a baguette from the boulangerie outside our door. Late that night we went to a gypsy jazz jam. This style of jazz is called jazz manouche in French, and if you’ve ever heard Django Reinhardt you are familiar with it. The jam was at La Venus Noire, a bar with an underground cave. Young, amazing musicians played guitars, a saxaphone, a violin, and a cajon for a little bit. We met a bunch of wonderful people, including an Irish and Scottish Texan couple with a newly collegiate daughter. Also, a young lady named Immanuelle from a French island off of the coast of Madagascar, called Réunion. Her English was very good although she hadn’t spoken it much in the previous 4 years. 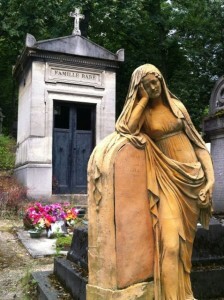 She had relocated to Paris to find a job; there aren’t many on her island. The cemetery looks so creepy especially after watching the weeping angels episode of dr.who. Wishing you two lots of fun and adventure! I hope your enjoying Sheila and Austin’s place. Yeah man we couldn’t have done it without them and their place! Thanks so much for the hookup!